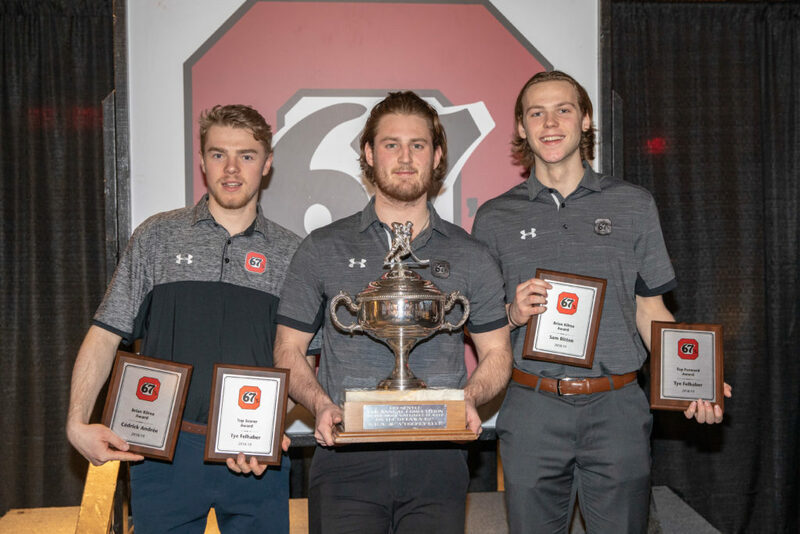 The Ottawa 67’s held their annual Awards Banquet on Monday evening, with one name coming up a few times throughout the night. Tye Felhaber, coming off a 59-goal, 109-point regular season, will have his name added to three 67’s awards. Standout rookie Marco Rossi heard his named called during the evening while Noel Hoefenmayer and Sasha Chmelevski were also honoured. Coming into his overage year with the 67’s, Felhaber exploded with a career year. His points total, along with his well-documented attributes as a leader, earned the Pembroke native an entry-level contract with the Dallas Stars. The Austrian forward finished the year with impressive numbers, scoring 29 goals and 65 points in only 53 games after missing some time to injury mid-season. Rossi’s rookie numbers eclipsed the ones of marquee ex-67’s in Tyler Toffoli, Sean Monahan and Logan Couture in their first OHL campaigns. This award is given to the player who best exemplifies leadership, courage and passion and his named after the former 67’s star. Chmelevski showed all of those characteristics this year as he took the next step in become one of the main leaders of this team. The fourth-year 67’s blueliner shattered his previous career high of 40 points with 16 goals and 62 points in 68 games this season. The Arizona Coyotes prospect also continued to mature as a leader on the team and a rock on the back end. This award, named after the legendary former 67’s Head Coach and GM, was awarded to local players Andree and Bitten for their tireless work in the community this year. From public skates to school appearances and just stopping to chat with fans, these two did it all – in both official languages. 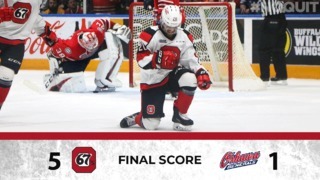 Showing dedication to their studies as two of the youngest members of the 67’s, Cranley and Tolnai are co-winners of the award honouring academic excellence in high school. Given to the player who shows a keen ability to balance the demands of hockey and education, Graeme Clarke is this year’s recipients following his second OHL season. Showing his ability to balance his education and his role as one of the 67’s leaders and top players, Sasha Chmelevski is this year’s Roger Neilson Memorial Award winner. 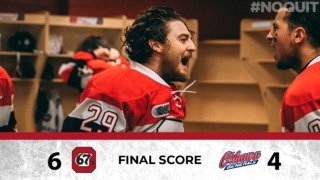 After finishing the regular season first overall in the OHL, the 67’s will kick off their playoff run on Friday night when they host the Hamilton Bulldogs in Game 1 of the Eastern Conference Quarter-Finals. 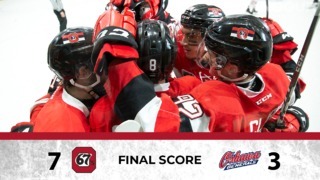 Tickets to all 67’s home playoff games are available by clicking here.